I kind of knew this reaction would come as Texas Gov. 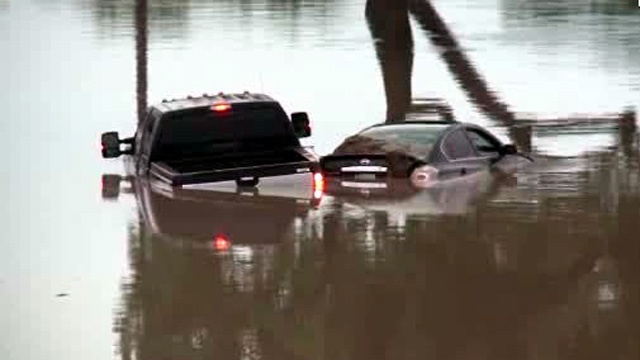 Greg Abbott asked the federal government for help in combating the state’s terrible flooding. It comes from former Labor Secretary Robert Reich, who served in the Clinton administration Cabinet back in the 1990s. This is what he wrote in his latest Facebook post. “Texas Governor Greg Abbott finally requested federal disaster relief, and the President has just signed the order, as record flooding continues. I don’t begrudge Texas billions of federal dollars — we’re all part of the same nation, after all – but I do recall just five weeks ago the same Greg Abbott assuring Texans who believed a federal military training exercise was a plot to takeover the state that he would call out the Texas national guard to monitor the exercises. “Not … incidentally, Texas’s congressional delegation contains some of the nation’s most outspoken deniers of human-induced climate chaos, such as Representative Lamar Smith, who charged that the White House report on climate change was designed ‘to frighten Americans,’ and whose congressional committee just slashed by more than 20 percent NASA’s spending on Earth science, which includes climate change. Except, Mr. Secretary, not all Texas believe as you have suggested. And … what about Jim Webb? I almost forgot about Jim Webb. He’s a Democrat who’s also running for president of the United States. Or at least he’s thinking about it. A recent blog I posted noted the entry of former Maryland Gov. Martin O’Malley into the 2016 Democratic presidential primary race. I mentioned that O’Malley joins Sen. Bernie Sanders as declared “anti-Hillary Clinton” Democrats and that former Rhode Island Gov. Lincoln Chaffee is likely to join the race. I didn’t even mention Jim Webb, the former U.S. senator from Virginia. It might be that I keep forgetting that Webb is even a Democrat. He served the Reagan administration, for crying out loud, back in the 1980s. Webb, though, has a nice following of supporters around the country who admire him — as I do — for his service in Vietnam as a Marine and his no-nonsense approach to governing. Future blog posts will have to mention this fine man. Joe Biden’s standing among Americans has had its ups and downs. The vice president is known as a garrulous guy, seemingly without a care in the world. The reality, which was driven home yet again this weekend, is that he has suffered more heartache than most of us. Vice President Biden’s son, Beau, died of a brain tumor. He was 46 years of age. He is survived by his wife and two children. As the essay by Ezra Klein notes, Joe Biden’s own political career almost ended before it really took off. In December, before he took office in the U.S. Senate, to which he was elected, the senator-elect’s wife and daughter died in an auto accident. His two sons, Beau and Hunter, suffered serious injury. Sen.-elect Biden was just 29 at the time he was elected and would celebrate his 30th birthday before being sworn in, making him constitutionally qualified to serve in the Senate. He wanted to quit. His friends talked him into staying the course. He took his oath next to his son Beau’s hospital bed. Sen. Biden would marry again. Jill Biden became his children’s new “mom,” and the couple brought more children into the world together. Klein’s essay recalls a startling speech Biden made in 2012, in which he said how he came to understand why someone would want to take their own life. They’d been “to the mountain top,” he said, and they knew they wouldn’t ever get there again. The vice president has been to several mountain tops in his most eventful life. As of today, though, he is suffering the level of grief that isn’t supposed to happen. He’s having to bury a child — yet again. Oh, the strength that lies within some of us. You can make a discovery on occasion just by reading the material that comes with your water bill. I did not know that there exists not one aquifer underground, but two of them. Our water bill arrived this weekend. I opened it up and started reading the “2015 Water Quality Report” issued by the City of Amarillo. In the very first paragraph, it informed me that we have (a) the Ogallala Aquifer and (b) the Santa Rosa Aquifer coursing under our feet. Santa Rosa? I didn’t even know such a thing exists. Or, if I knew about it already, I must have forgotten about it. The Santa Rosa consists of “brackish” water, or water than is a good bit saltier than potable drinking water. Tulia — a town just south of Amarillo — has access to it. It runs under the Ogallala, which is spread under seven or eight states. The Santa Rosa is a good bit smaller in size, but it’s there. I take some heart in learning about the Santa Rosa. The city already has secured significant water resources that officials say will last for a couple of centuries. Beyond that, well after we’re all gone, it’s anyone’s guess. None of the water rights secured, I’m pretty sure, involve the Santa Rosa. It’s going to be expensive to pull this water out of the ground and make it suitable for drinking. Desalination projects clearly must be developed here for humans to consume the water. You can learn things from unexpected sources, yes? I’m glad I took a minute to read the water bill handout. Maybe I ought to read more of this stuff. One of the recurring themes of my column, back when I worked as a daily print journalist, used to drive incumbent officeholders nuts. I liked to write during election season that no incumbent — regardless of his or her record — deserved to run unopposed for public office. Every so often, I’d write such an essay and I’d hear from an incumbent who’d gripe half-heartedly about my insistence that they draw an opponent. So it is with some joy that I welcome the entrance of another challenger to Hillary Rodham Clinton in the 2016 Democratic Party primary race for president of the United States. Wait. Hillary’s not an incumbent? Oh, I almost forgot. But she’s such a prohibitive favorite to win her party’s nomination next that she might as well be one. Former Maryland Gov. Martin O’Malley has joined the field. I’m not sure precisely how he’s going to separate himself from Clinton. He wants wage equality; so does she. He wants to improve everyone economic future; same for Clinton. He calls himself a “liberal”; I’m betting Clinton will tack to the left as well. He referred to Clinton as a “dinosaur,” and promises to bring fresh ideas. The “crowd” that greeted his campaign kickoff was, to say the least, modest in size — about 300 or so supporters; Clinton draws that many while she’s eating at a diner. O’Malley’s in, along with Vermont U.S. Sen. Bernie Sanders, a card-carrying socialist; it looks as though former Rhode Island Gov. Lincoln Chafee — a one-time Republican — is going to run as a Democrat, too. Good. The more the merrier. Clinton remains the heavy favorite for the party’s nomination and is a favorite still to win the White House in November 2016. But she’s going to get a test in her primary. The individuals who will challenge her will — and should — ask her about her coziness with big banks, overseas contributors, her work with the Clinton Foundation and whether she actually built a record as secretary of state and as a U.S. senator before that. Competition is good for the process, not to mention for the candidates’ souls. Did the planet just reverse its rotation, causing the sun to rise in the west? Has the world spun off its axis? Did the Easter Bunny really just appear? I am still trying to get a grip on an indictment that alleges that former U.S. House Speaker Dennis Hastert — a Boy Scout, or so I thought — paid a student back in Yorkville, Ill., to be quiet about a sexual episode involving the then-wrestling coach who went on to become second in succession to the presidency of the United State of America. Hastert became speaker after Newt Gingrich resigned and after Bob Livingston, who was next in line to become the Man of the House, admitted to an extramarital affair, forcing him to drop out of contention. So the House picked Hastert, a virtual unknown outside of Illinois. He’s a lot more well known now. The federal indictment alleges hush money and tax fraud involving the former speaker. Good grief in heaven, this is going to get weird. Well, these things have ways of developing lives of their own. I’m willing to bet real American money this one will linger for a long while. This is one of the more fascinating steps so far in the quest to rebuild downtown Amarillo. The downtown design committee has signed off on the concept for the looks of the proposed Embassy Suites hotel that will be built near the Civic Center, the proposed multipurpose event venue — aka MPEV — and a multi-story parking garage. It’s all coming together, the city and its design consultants say. The design panel needed to ensure that the hotel fit the city’s aesthetic standards. I’ve seen the renderings of what the complex is going to look like. They are impressive, to say the least. The funding of the project remains as stated: hotel-motel tax revenue will fund it, along with tax breaks granted by the city and, presumably, by Potter County, given that the district lies inside the county line. Some skeptics remain out there, thinking nefarious thoughts about who did what to and for whom and whether it’s all on the up-and-up. I’m not one of them. I continue to embrace the concept as it has been presented. I will continue to hold onto my faith that the city’s funding formula will hold up and I will continue to hope for the very best that the city — along with the developers and investors it is trying to recruit — will deliver the goods as promised. Just make sure, folks, that it’s all, um, appropriate. Hey, no kidding. Texas actually can use some help from the federal government. As I understand it, Gov. Greg Abbott has to ask for a federal emergency declaration. The pictures I’m seeing from around the state, particularly in Houston and in the Hill Country, suggests the governor needs to get on the stick and ask for it. Has he done so? I haven’t heard that he has. Abbott calls the floods the worst in Texas history. As I’m writing this short blog, another storm is blasting overhead along the Texas Panhandle. It’s dumping more rain on our saturated ground — which isn’t nearly as soaked as the ground is in Houston, the Golden Triangle, the Coastal Bend and the Hill Country. But it’s wet enough here. My son, who’s visiting us from Allen — just north of Dallas — informed us of playas that appeared where there’s “never any water.” Well, he can’t say “never” now. Ask for the feds’ help, governor. And whatever you do, don’t let your political differences with the White House stand in the way. ‘You need to read the Internet more’ Huh? This conversation occurred this week. Friend: Hey, what’s your opinion of that Jade Helm thing? Isn’t that what they call it? Me: Yeah, you mean that rumor about the president declaring martial law and wanting to invade Texas? Friend: That’s the one. Do you think it’s crap? Me: Absolutely! But what really galls me is that the governor (Greg Abbott) took the bait and called out the Texas State Guard to “monitor” the activities of the federal troops coming here for military exercises. Friend: I’m OK with that. Me: (laughing hysterically) You mean you actually think that Abbott responded the right way by policing the activities of the troops? Friend: Yes. I don’t trust Obama. I think he wants to declare martial law so that he can weasel his way into serving a third term as president. Me: I haven’t heard that one. Friend: Well, you need to read the Internet more. It’s out there. Me: (laughing even more hysterically) But, but 98 percent of the stuff on the Internet is pure crap! Me: OK, well, I’ll do that. But I’m telling ya, most of that Internet stuff is not to be believed. I promise you that on Jan. 20, 2017, the new president will take the oath of office and Barack Obama will leave the White House with his wife and daughters and return to private life. Friend: I sure hope so. I laughed at him, too. Bill Press is a Democratic Party operative. He’s as partisan as they come. Thus, it is with keen interest that I share this Facebook post that Press put out there. Bless me Father, for I have sinned. I have a man crush on Rand Paul. Yes, it’s enough to drive me to confession: Every day I find myself agreeing more and more with the Libertarian from Kentucky. He may be running for president as a Republican, but he says some things that any liberal Democrat could support. Who’s the leading champion to shut down NSA’s vast phone spying operation? Rand Paul! Who blames Republican hawks, not Barack Obama, for the Iraq War and the eventual rise of ISIS? Rand Paul! No wonder I have such a man crush on Rand Paul. But I’d feel a lot less guilty – if he’d just run as a Democrat! It’s rather weird, but I am feeling the same kind of “man crush” myself about Sen. Paul. However, I’m not a paid partisan hack. I’m just a guy out here flapping my proverbial jaws about politics and other things. Bill Press is finding himself being drawn into saying nice things about a Republican against his partisan loyalties, given that he works for Democrats, who pay him real American money to offer them political advice. Therefore, I am thinking he needs an intervention. Am I likely to vote for Paul should he obtain the GOP presidential nomination? Probably not.